With subjects from a wide variety of local sources, John Freeman never fails to enchant your attention. This image depicts the famous "Pull" of the Whitby Lifeboat the Robert Whitworth overland from Whitby to Robin Hoods Bay. The `Bay Lifeboat was unseaworthy and so was unable to assist in the rescue of the stricken brig "Visiter". The idea of taking the Whitby Lifeboat overland was suggested by Coxswain Henry Freeman. 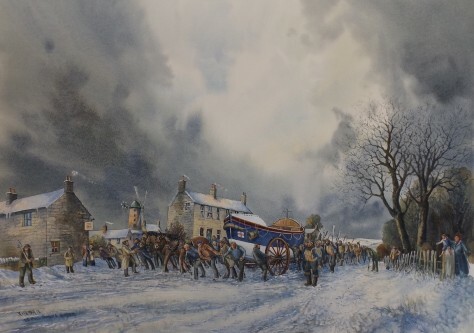 It took over a hundred men along with horses to pull the boat through driving Snow and drifts. They accomplished this in three hours! The launch of the lifeboat at Robin Hoods Bay is depicted in John`s other study "The Rescue". Signed Giclee` Print. Image size approx 20" x 15"